Soak the Rich - What Does It Mean? What is the definition of "soak the rich" and "soak the rich economics"? Many states are currently wrestling with large budget deficits that have been caused by the "Great Recession". These states are largely choosing to battle the problem by engaging in a "soak the rich" strategy. So what do "soak the rich" and "soak the rich economics" mean exactly? When you "soak the rich", you are looking to extract more money from "rich" people in the form of taxes and fees. For instance, a state might have a maximum income tax rate of 6.25%. In order to help close a budget gap, the state may elect to raise state income taxes to 8.25% on the richest people in the state (those earning over a certain amount). The theory is that these people can afford to pay this extra money, so this is the easiest method in which to raise extra money for the state coffers. It is also the most popular with voters, as high income earners make up just a small % of the general population. The problem with this theory? As many states are now realizing, higher income earners are mobile and will gladly leave for "tax-haven" states such as Texas, Nevada and Tennessee. This creates a smaller base of "rich" people to extract taxes from. 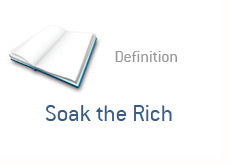 "Soak the rich" is a general theory that can apply to state, federal or municipal taxes. When President Obama was elected, many people bemoaned the fact that he would seek to "soak the rich" to pay for some of his new spending programs. Your basic definition of the term is - expecting higher-income earners to shoulder a higher tax burden in order to (in theory) generate higher tax revenues.